In an increasingly mobile world, phone numbers have taken on tremendous importance and value. More than just a way to reach us, they have become a way to identify us. In fact, no other identifier distinguishes billions of people and enterprises in a standardized, non-proprietary way, regardless of geography or technology. That’s why managing telephone number inventory is not only core to your business as a communications service provider (CSP), it’s critical to expanding your identity and subscriber data initiatives. But it’s no easy feat. You clear hurdles to get numbers, shuffle them between markets, track them, and forecast how many you’ll use. As your business grows, so does the complexity of managing and reporting on your number inventory. Inventory may reside in multiple databases after a merger or acquisition, and you may end up managing more services and customer IDs with the same or fewer provisioners and number administrators. With these forces in play, you need efficient ways to manage inventory—all while abiding by rules and regulations to avoid issues that can hinder your ability to obtain new numbers. Number inventory management is complicated and, without attention, can be costly to your business. Talk about stressful. Are number assignment errors impacting customers? Is required regulatory reporting an intense process? Do you have too many or too few available numbers? Given the challenges, it may be tempting to forestall making changes. But inertia can hinder your competitiveness and directly impact revenue. In this light, taking a fresh look at managing number inventory makes sound financial sense and can provide rapid and measurable return on investment. 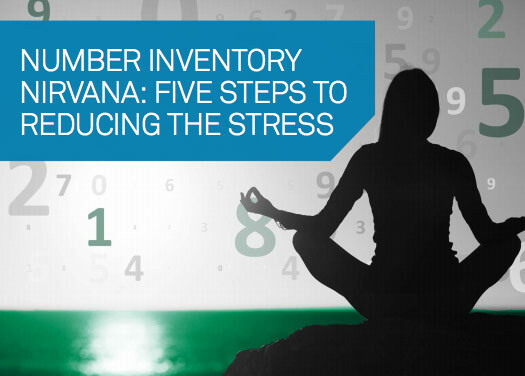 You can substantially reduce the stress associated with managing your telephone number inventory by following five simple but effective steps. These five guiding principles are based on Neustar’s extensive experience in working with number and provisioning professionals across hundreds of CSPs and handling billions of transactions in the United States. So let’s get started. Our destination: Number Inventory Nirvana. Perhaps the biggest source of pain is having your telephone number inventory scattered across several locations and in different formats. Multiple resources managed by numerous teams contribute to data inaccuracies and discrepancies that negatively impact your customers and business. To substantially alleviate that pain, consolidate your number resources into one database. Doing so creates a single source of truth that can be acted on reliably by your entire organization. Multiple databases, models, and processes are often a result of a merger or acquisition. In those cases, you might decide to work with an experienced telecom services partner to assist with the data migration and cleansing processes. Once your data is consolidated, it’s time to alleviate the burden of manual processes. It’s time to get automated. In addition to reducing the mistakes caused by human error, automation speeds the assignment and provisioning process for new customer activations, generating additional revenue for your business. Automation also brings a level of consistency to processes, like number assignment, that’s rarely achieved manually. Assigning numbers in an orderly fashion helps preserve clean and donation-eligible blocks, which when pulling and assigning new numbers, simplifies reporting and auditing down the road. Finally, automation allows you to work with number inventory data in near-real time for more accurate and reliable decisions. Part of the challenge of tracking number inventory is that telephone numbers themselves can be moving targets. Local number portability (LNP) guidelines require CSPs to track and report on telephone numbers that have been ported in and ported out. Not surprisingly, this can get very complicated, especially when your number portability and number inventory systems don’t communicate with each other. Integrating number portability and number inventory systems helps CSPs accurately track moving numbers, which leads to better number pooling practices and higher regulatory compliance. For code and number administrators, simplifying the process of producing the semi-annual Number Resource Utilization/Forecast (NRUF) reports for the North American Numbering Plan Administration (NANPA) is the Holy Grail. The Office of Management and Budget (OMB) estimates that it takes CSPs 44.4 hours to complete each NRUF report for each service provider ID (SPID). Now imagine that process taking minutes rather than days or weeks. With automation, you can easily run your NRUF reports in advance to identify and resolve issues prior to submitting your final report. Finally, automation can help you more accurately forecast future numbering resource needs based on historical trends, which benefits your business and provides more accurate information to NANPA. The final step involves being more conscientious of your market utilization—through proactive monitoring. As the culminating result of taking steps one through four, this step enables your code and numbering administrators and provisioners to spend more time on activities that drive revenue and less time putting out fires. Access to reliable, real-time information allows CSPs to manage their number inventory better and ensure that adequate inventory is available to meet market demand and support new sales initiatives. Manual processes might work for a short while—but with growth, complexity, and compliance requirements, they heighten stress. Number inventory is best addressed with automation that allows you to scale your operations, deliver a better customer experience, and comply with regulations. Neustar frees you from the limitations of spreadsheets and the burden of manual, paper-based processes, so that you can manage and report on inventory with complete confidence.